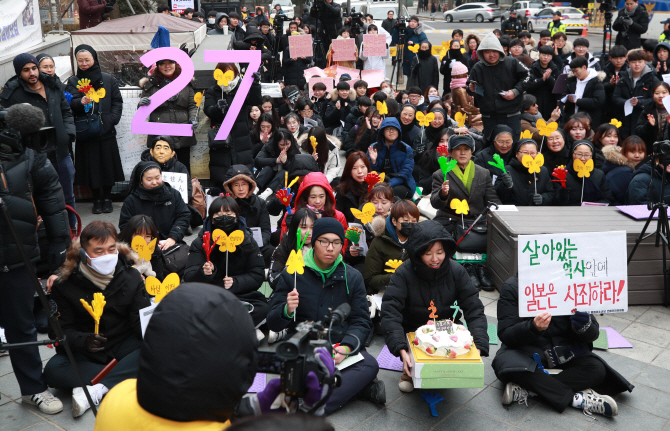 SEOUL, Jan. 9 (Korea Bizwire) — A weekly civic rally calling for the Japanese government to give an official apology and compensation to the Korean victims of the Japanese army’s World War II sexual enslavement marked its 27th anniversary Wednesday. The first Wednesday rally was held Jan. 8, 1992, on the occasion of then Japanese Prime Minister Kiichi Miyazawa’s visit to Seoul. The Korean Council for Justice and Remembrance for the Issues of Military Sexual Slavery by Japan organized it. “We’ve long made a seven-point demand to Japan, including an official apology, compensation, punishment of those responsible for the crime, and the establishment of a memorial and a historical museum,” the council said in a statement during its 1,369th protest in front of the Japanese Embassy in Seoul. “But the Japanese government has yet to admit the crime and to apologize for it,” it said. The rally has been held usually in the presence of former comfort women, but they could not attend the anniversary due to health problems. At present, only 25 former comfort women are alive in the country. It’s good that they let their voices heard. While the majority of woman forced into this where Chinese, Korean, woman in other Japanese occupied territory where also forced. Dutch East-Indies, Indonesian but also Dutch woman were comfort woman, in Dutch they are called “troostmeisjes” Australian woman were forced in to this. The scars in body and soul where often kept hidden for decades. Thank you for your comments. It is very ture that these women have been carrying the scars from the past history, which has not healed yet, hoping their truthful stories can be reached out more. Thank you for your comment Marie-Jacqueline! Yes, it is absolutely true that there are many more women who were forced into such crime against humanity. I wish that there’ll be bigger changes in the near future and hope that more people from all over the world will care about this issue.